The other day I thought wouldn't it be amazing if XO users all over the World could communicate with each other? As orders are taken through the Give One - Get One program and people contemplate XO user groups, promotional gifts and just plain having fun with their XO I asked myself how will users be able to take advantage of the collaborative aspects of the XO software activities? If I sit at home looking at my XO neighborhood screen how many other users can I see? Obviously none if no one is within wireless mesh range. How then should I be able to collaborate with others? What if I could be in range of other users around the World? Surely the World Wide Web can help out here? So I thought: Why not build a webserver application that can connect XO users? Suddenly my XO neighborhood screen will fill up with other XO users that are using the very same webserver to connect us all together. I have yet to work out the details for the server but I can see it working much like the OLPC School Server does with wireless access points. As always, a great incentive is getting a website started and promoting the concept of a world wide mesh. To that end I've purchased the domain name xouser.com/.net/.org and started to look at what I'll need to put it all together. The purpose of the website will be little more than a registration site for XO users to obtain a small client program and access to the mesh. Once registered, their XO will treat the server like a meeting point where the XO neighbourhood is populated by other users around the World. You will be able to see what other users and groups are collaborating on and start collaborating with other users. The concept of client-server based systems has been around for a long time. Most of the Instant Message applications like the classic ICQ of the late 90s, MSN Messenger, Yahoo and many other all rely on a server somewhere to act as a central log in point to find others and talk to them. Many Linux users use Gaim (now known as Pidgin) that lets people access servers for many different IM programs and protocols. The G1-G1 program was a great way for the OLPC to get money to pay Quanta for the first production batch of laptops. It was also a great way to get funding for distributing laptops to less fortunate students in other countries. Unfortunately, by providing laptops to those that donate, the isolated laptop user misses out on the real advantages of a mesh connected, activity collaborating machine. I hope that XOUser.com manages to alleviate the problem and brings XO Users around the World together. Robert, good thoughts in your post. I know from various posts on the OLPC developer's listserve that there's concern about the Neighborhood view filling up extremely quickly once people all over North America start connecting via WiFi. Your vision for a web server application mostly exists: The Neighborhood view, when a connection to the open internet is available, shows the user icons for anyone also connected from a beta machine or running the software emulation on a desktop PC. The presences of all these people are currently handled through a customized installation of Jabber on an OLPC server. It's the Jabber server that routes chat messages between folks. I don't imagine that OLPC will have any interest in running Jabber services for the whole world. But I'm sure server savvy programmers will be attempting to install and enhance their own Jabber instances. Hopefully on your domain! It would be immensely useful for people who don't want to mess with the UNIX command line on their XOs to point the presense service to any arbitrary XO compatible Jabber server to have a control panel where one can enter, store and activate server addresses. Indeed, when I started up the latest OLPC image in a VM on Windows at 2am I saw other users like yoshiki and such in Neighborhood view. I invited a few of them to share my Writing activity... I think. It's cool, though I wasn't sure how to simply msg them or how they could find out more about me. Perhaps each local Linux group might find a volunteer and machine to run a ejabberd server, and presumably there's a way on the Internet to tell your XO to connect to a local jabber server instead of jabber.laptop.org. But I'm just jabbering. Well I kind of wrote this before I understood the full implications of what the XO could do. After asking about collaboration across the Internet on the Sugar Mailing list I was set straight by Morgan Collett from Collabora, the company that provided a lot of the Intercommunication tools for the laptop. Telepathy is using two connection managers, telepathy-salut provides link local presence and sharing which is for those in mesh range, and telepathy-gabble which provides presence and sharing via a Jabber server. The Presence service automatically registers with the Jabber server, so no front end is necessary. In the field, each school will have a schoolserver which will include this Jabber server. At present, and for G1G1, there is a Jabber server preconfigured. When you have internet access, it will "Just Work". The Neighborhood screen does show all those on that server currently. The server currently in use on the images is jabber.laptop.org. I don't know whether that server will be the default for G1G1 but I haven't heard otherwise. The server configured in the sugar-jhbuild emulator is olpc.collabora.co.uk, which is intended for developers - so if you run a sugar-jhbuild instance it sees a different server by default to the XO images. The jabber server can be configured using the control panel (http://wiki.laptop.org/go/Sugar_Control_Panel). So there you have it. Your XO should be able to see all the other XOs around the world once you connect to the Internet. Thats supposing the Jabber server is running. Now also there was some discussion on the future of the Neighborhood Screen on the Sugar mailing list so I'll follow that closely to see where it heads. I hope to set up a Jabber server shortly on a spare machine at my datacenter. I have a feeling there will need to be a lot of them once G1G1 starts shipping. 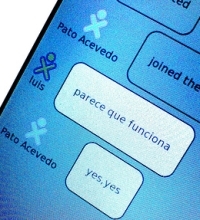 "Those collaborative features are wondergul, everytime I turn my XO on I see at least 50 XO from uruguay"
Note that he was in sao paulo, more than a thousand kilometers away..
At least when the G1G1 machines first arrive there will be no jabber server. So your idea with a community jabber server sounds good to me. Alexandre, When 20,000 XO laptops connect to the Internet what do you think will happen? That Neighborhood screen is going to get very busy. You will be able to filter user groups according to the Sugar mailing list. I'm a bit concerned about scalability though. A related question. For teachers using the XO in the classroom, I thought it be great if the G1G1 donor could connect with the student who receives the other donated XO. Sort of the modern day "pen pal". Anyone know if any plans are in the works regarding this? Social Networking, perhaps compatible with Open Social, should allow the students to get in contact with other students worldwide to collaborate on research, collaborate on learning activities, optimize their learning experience by being able to focus on their very specific areas of Interest. So this nabourhood view should provide lots of personalised access for each students based on "Projects", "Areas of Interest" and lots of other algorithms, it could also just be gaming. But also through somekind of online video and photo sharing service, something like Youtube and Flickr but using the specific video format and picture resolutions of the XO users. There should be online video storytelling competitions, online picture competitions, worldwide collaboration on storytelling and problem solving. A bit like http://wiki.laptop.org/go/Our_Stories but it should be at the fingertips of every XO user. Maybe someone could combine this with my idea from a week or two ago of setting up a webserver with a sugar interface runnning in a browser window, with everyone online being the neighborhood. Except now it would be extended so that if you logged on with your Dell-Vista machine you would be in the world XO network. Maybe sugar would take over the web. Wayan, I'm glad you asked. I have a Ejabberd server under test at the moment and testing it with a laptop running Xubuntu Sugar Live CD. I hope to have it available for XO owners by the time people start receiving their laptops. I also need to do some presentation work on the site itself with information on how to connect your laptop to the server. I was hoping to utilise some of my staff to help me but its the holiday season and we have a few people away. I'm sure I'm not the only inconsiderate jerk to change their jabber settings to point to the production value... I'm excited to see what will happen when xouser.com gets further along. Any suggestions for a better jabber server to use? Lovely idea. Looks like the site's down currently, but I'm exited to see where this goes. Seems like these sorts of virtual meshes will be extremely important to stimulate development of software which takes advantage of the mesh. Wondering if the mechanism(s) that you'll be created will be able to allow users to create adhoc groups self-serve style. I might be able to set up a jabber server myself, but would love to avoid getting into the business of running one. Can you download iTunes or something download-able on the XO? If you could answer that, it would help me out a lot.